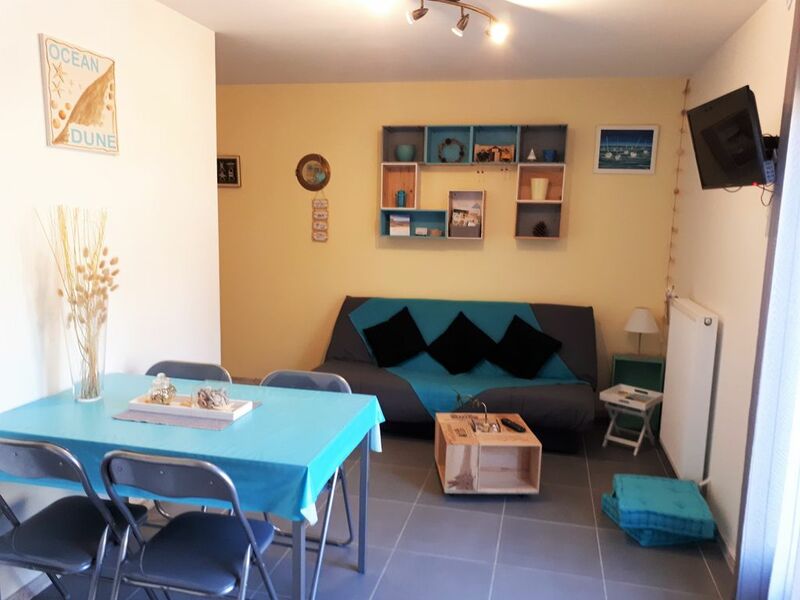 Located in Gujan-Mestras, on the Bassin d'Arcachon and on the edge of the forest of Landes in Gironde, our holiday apartment is close to all amenities. "DUNE" is a very bright, brand new housing of 32 m2, full foot, on private land owner with independent entrance and parking space in front of housing, in a very quiet residential area. Ideal for a single couple or a small family (2 adults and 2 children max). "DUNE" has 2 other twin accommodations right next to "FORET" (listing 1452191) and "OCEAN". See rentals on website "locabassinlouis". - Separate bedroom with double bed 140 and shower room: large shower, washbasin, wc. - Fully equipped kitchen: gas stove with oven, microwave, coffee maker, toaster, refrigerator. - Living room and kitchenette: sofa bed (Clic-Clac type) with children's bed, flat screen TV. - 1 parking space vehicle in front of the rental. Charges included: water, electricity, heating for the winter. At your disposal: washing machine, iron and ironing board, vacuum cleaner. - Sheets, fitted sheets, pillowcases and bolster case. - Weekend lovers: services and personalized services according to your request. If you want one of these services, thank you to make us the request by mail or telephone before your arrival. Services to be paid on the spot. WE DO NOT SUGGEST BREAKFASTS. - Rent by the night, 2 nights minimum outside the period July / August. - Rental at the weekend possible. When renting a deposit of 150 euros will be required on arrival (not cashed) and an inventory will be realized. - Butcher, Fishmonger, Tobacco, Fruits and vegetables, Restaurant La Boucherie, Cafeteria Creshendo, Pizzas de Mamma 3 minutes. - Close to the activity and leisure area: tree climbing, bowling, swimming pool, casino, mini-golf, golf, Aqualand, Coccinelle Park, KidParc, nightclub, LaserLander. - 2 other twin apartments next door, ideal for holidays with family or friends. Our rentals are ideally located to visit the Bassin d'Arcachon by car, bicycle or bus. Ideas for visits: Visit the oyster huts and the 7 typical and preserved ports that make Gujan-Mestras the capital of oyster culture, boat trip on the Arcachon basin, descent of the Leyre in canoe, coastal path by bike , ornithological park of Teich, dune pyla, lighthouse Cap-Ferret, Bordeaux, Landes coast. We offer our weekend package of lovers with services and services specially designed for you! 2 nights mini, from October to May, except school holidays. For more information before booking or see our website "capforetadune"
Magali et Ludovic LOUIS "locabassinlouis"
Ideal for a holiday on the Bassin d'Arcachon with your family! Nous sommes ravis que vous ayez passé un bon séjour. Merci de votre commentaire qui nous va droit au coeur. Au plaisir de vous revoir. Merci beaucoup pour votre commentaire. Au plaisir de vous revoir pour visiter notre région. Dans quartier résidentiel très calme , nous avons passé un trop court séjour . Le logement est très fonctionnel ( une prise de courant dans la salle de bain serait la bienvenue ) très propre et très bien décoré . La cour est très agréable . Nous vous remercions sincèrement pour votre appréciation. Nous sommes ravis que votre séjour se soit bien passé et que vous ayez apprécié notre location. Au plaisir de vous revoir sur le Bassin. Agréable séjour pour découvrir le bassin d arcachon. La location est très calme et la terrasse appréciable. La décoration est soignée et très propre. Magali est tres accueillante et réactive aux demandes. Nous recommandons sans hésiter cette location. Au plaisir de vous revoir peut être pour continuer la découverte du Bassin d'Arcachon. Nous avons passé un très bon séjour. La location est cosy, bien équipée, tres lumineuse, avec une petite terrasse pour profiter de manger ou prendre le petit dejeuner dehors ou encore se relaxer après les balades. Le logement est bien situé pour les visites du Bassin et à proximité de tout. Complètement conforme au descriptif et en plus avec le soleil et les petits oiseaux qui chantent dans un quartier au calme. Que du bonheur. Nous reviendrons, c'est sûr! Merci beaucoup pour votre commentaire. Nous sommes ravis d'avoir fait votre connaissance. Au plaisir de vous revoir sur le Bassin. - Close to the activity and leisure area: tree climbing, bowling, swimming pool, casino, mini-golf, golf, Aqualand, Coccinelle Park, KidParc, nightclub, Parc des Expositions, laserlander.